A listing of the cemeteries within the Municipality of Ormstown (including the old Municipalitie de la Paroisse St-Malachie-d'Ormstown) that was originally within Châteauguay County (1855-1980) and is now in the MRC de Haut-St-Laurent. The original St-Malachie Cemetery was the first Catholic cemetery in the upper Châteauguay Valley, dating from the late 1820s. At that time, the parish had not yet been officially established and was called the Mission of St-Malachie. It served all of the Châteauguay Valley area from Ormstown to the US border including Godmanchester and Hinchinbrooke. The Parish of St-Malachie was established in 1858 and the church moved to its present location on the south side of the river at the Village of Ormstown. It appears that neither the cemetery or its memorial stones were moved but left and eventually allowed to disappear. The old St-Malachie Cemetery was located on the James Finn farm (old lot 40) on the north side of the Châteauguay River, 5.1km (3.2mi) west of the Village of Ormstown. (45.122N/74.058W) The site is now privately owned farmland and all traces of the cemetery have disappeared although the owner indicated that there may still be a few base stones on the side of the adjacent creek. The cemetery was originally in a grove of trees and the story is that a tree was planted for each burial. The problem was that the trees were elms and they all succombed to Dutch Elm Disease in the past 50 yrs. The monuments were not moved but were dispersed locally being used for other purposes such as walkways, etc. In the 1960s, the local parish priest arranged for the erection of a commemorative memorial at the side of the road, nearest the location of the church and cemetery. 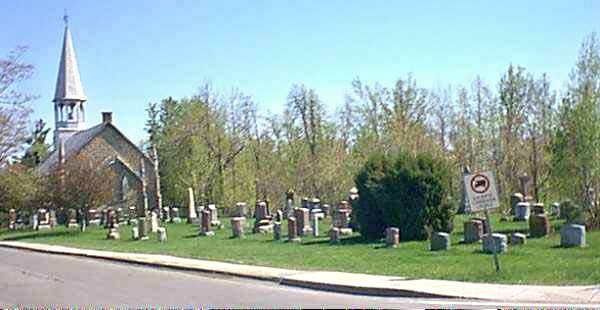 The actual location of the cemetery is about 350m north of the road, near the creek (called Finn Creek). No one appears to be taking responsibility for the maintenance of the monument and its surroundings, even though this was part of the agreement with the land owner when it was erected. Click on image to link to Inscriptin Name List. The Ormstown Union Cemetery is a large protestant cemetery serving the Presbyterian and United congregations in the region of Ormstown, Quebec. It was first established in 1890 for the congregations of the St-Paul's Presbyterian and St-John's Methodist churches. It is located on the southeast side of Rte 138, 0.9km (0.6mi) northeast of the junction with Rte 201 at the Village of Ormstown. (45.123N/73.976W) The cemetery is owned by a non-profit corporation and managed by a largely volunteer committee. When the cemetery was established, the older cemeteries belonging to St-Johns Methodist Church and St-Paul's Presbyterian Church were largely closed and some or all of the old monuments and possibly some remains moved to the new cemetery. Note: In Oct 2003 and summer 2004, a complete set of pictures has been taken of this cemetery. They have been edited, transcribed and an index prepared. We are now researching the church records of the area and newspaper announcements to add to the database. This will take some time yet. Meanwhile a list of the names that appear on the monuments has been put on-line. The St-James Anglican Cemetery dating from 1854, serves the congregation of the adjacent St-James Episcopal Church. It replaced a previous older cemetery located a short distance to the south. It is located at the corner of Church and Gale Streets in the Village of Ormstown. (45.127N/73.995W) The cemetery is owned by the church and is maintained by a small committee of dedicated workers. Using burial records supplied by the committee, this cemetery is now on-line. Note: During Oct 2003, a complete set of pictures has been taken in this cemetery. They have been edited and will be used with church record and newspaper announcements to update, correct and expand the previous transcription listing that is on-line. The original St-James Anglican Cemetery dated from the early 1830s until 1854 when it was relocated to its present location. It was located behind the original church at the corner of today's Lambton and Church Streets. (45.126N/73.995W) The location now has commercial buildings on it and it is believed that Campbell's Plumbing Store or its shop at the back of the store, is over the actual cemetery location. It is not known whether any stones or remains were moved to the present cemetery although there are inscriptions dating back to 1831 in the present cemetery. Some remains were encountered during construction of the commercial buildings so it is probable that most remains were not moved. There is no visible evidence of this old cemetery at this time. The St-John's Methodist Cemetery was an old protestant cemetery serving the St-John's Methodist Church dating from 1854 until Ormstown Union Cemetery was established in 1890. It was located at the back of the St-John's Methodist church, on the west side of the present Bridge Street, a short distance south of the bridge, where the Caisse Populaire is now located. 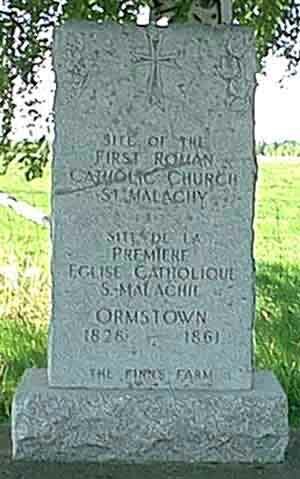 (45.124N/73.992W) It is believed that some of the remains and the monuments were moved to Ormstown Union Cemetery between 1890 and the late 1920s when the property was sold to the St-Malachie Catholic Parish. There is no sign of any Methodist monuments on the site today. The St-Paul's Presbyterian Cemetery was an old protestant cemetery dating from 1834 until 1890 when the Ormstown Union Cemetery was established. It was located on the west side of St-Paul's Presbyterian Church (now St-Paul's United Church) on Lambton Street at the corner of Bridge Street and behind the present McDougall Hall. (45.125N/73.995W) When the Ormstown Union Cemetery was established in 1890, many but not all of the remains were moved to the new cemetery. A number of stones remain and have been gathered together on the side of Martin Creek at the back of McDougall Hall and the Manse, at the northwest corner of the actual original burying ground. According to dates on the remaining stones and newspaper announcements, it appears that burials were continued on these grounds for some time after 1890, possibly as late as 1929. The remaining stones in this cemetery were documented in Sept 2001 and published as a book of monument inscriptions 1.